The Cool Star Lab has joined the SDSS Faculty and Student Team (FAST) initiative, with a research program focused on analyzing high resolution spectroscopy of ultracool dwarfs with SDSS-APOGEE. Cool Star Lab alumna Aishwarya Iyer, currently a Master’s student at CSU Northridge and intern at Jet Propulsion Laboratory, has recently published work on exoplanet atmospheres that has been featured in a NASA Press Release. Her paper, “A Characteristic Transmission Spectrum Dominated by H2O Applies to the Majority of HST/WFC3 Exoplanet Observations“, published in the Astrophysical Journal, concludes that most hot Jupiter atmospheres likely contain water vapor, even those that show weak water features. This is due to the role of hazes and clouds, which can obscure molecular gas features. Aisha and her team performed a comprehensive analysis of 19 Hot Jupiter transmission spectra taken by HST/WFC3, and modeling analysis indicates that the bulk of water vapor lies below the cloud layers. This work is a major advance in understanding the role of clouds and haze in exoplanetary atmospheres, which are also important constituents in brown dwarf atmospheres. 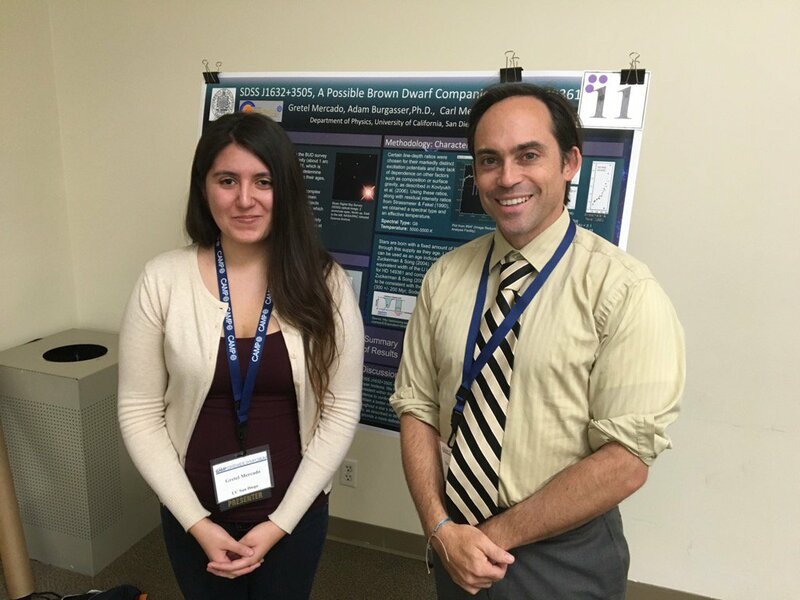 Undergraduate research Gretel Mercado presented her research investigating a possible brown dwarf companion to a nearby star at the 2016 CAMP Statewide Symposium at UC Irvine. 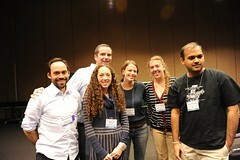 Gretel is a member of the UCSD chapter of the California Louis Stokes Alliance for Minority Participation in Science, Engineering and Mathematics (CAMP – LSAMP). This NSF-funded program provides support and advancement opportunities to students defined as underrepresented by the NSF who are seeking bachelor’s degrees in chemistry, physics, cognitive science, biology, other sciences, mathematics, engineering and technology. It is one of many initiatives started by the recently deceased senator from Ohio Louis Stokes to advance underrepresented minorities in science and education.